Sallie splits her time between Nashville and Asheville. Deadliest of Sins is the sixth book in the Mary Crow series. Sallie Bissell returns to City Lights Bookstore to read from and sign her new novel, Music of Ghosts, on Saturday, May 11th at 3 p.m. When a group of college students visit a haunted cabin, deep in the Appalachian woods, one is brutally murdered and her flesh mutilated with disturbing symbols. Attorney, and Pisgah County native, Mary Crow must navigate through ghostly legend and truth to find out who the killer really is. Bissell is a Nashville native and divides her time between her hometown and Asheville. She has written four other Mary Crow novels, all set in the Appalachians. 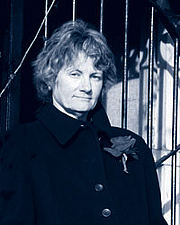 Sallie Bissell is currently considered a "single author." If one or more works are by a distinct, homonymous authors, go ahead and split the author. Sallie Bissell is composed of 3 names. You can examine and separate out names.